Awhile back I featured my crafty cousin Elle on this blog. Remember her cute baby onesies? Not only is Elle into quilting, sewing, photography, cooking and ... creative pumpkin carving (this you GOTTA see! ), but she's a fantastic scrapbooker! And for Stacy's auction, she has donated five pre-made 12x12 scrapbook layouts! Thanks so much, Elle. All five layouts will be auctioned as a set. They are lovingly made by Elle of acid-free, archival safe paper for long-term preservation. I love all the embellishments and papers she has chosen. They're perfect! 1. 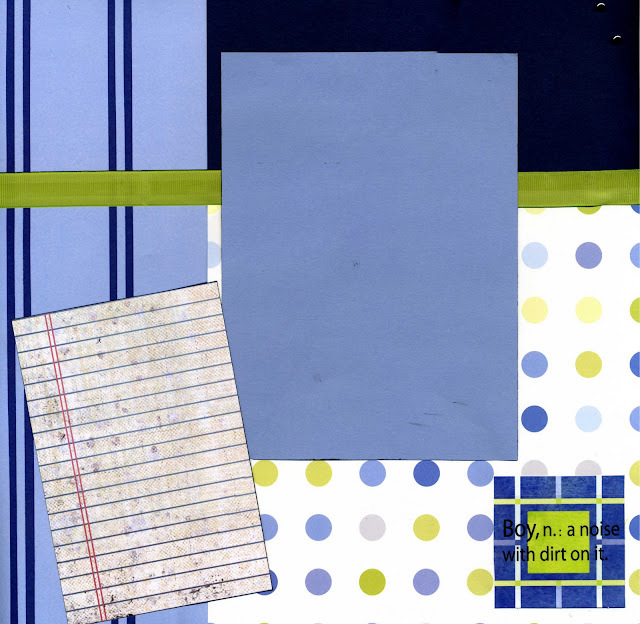 Boy - 12x12" layout in blue using multiple patterned papers, ribbon, basic brads and quote embellishment "Boy, n.: a noise with dirt on it". An inked 4x6" journaling block has been created at the left and a mat area large enough for a 5x7" photo is in the center. 2. 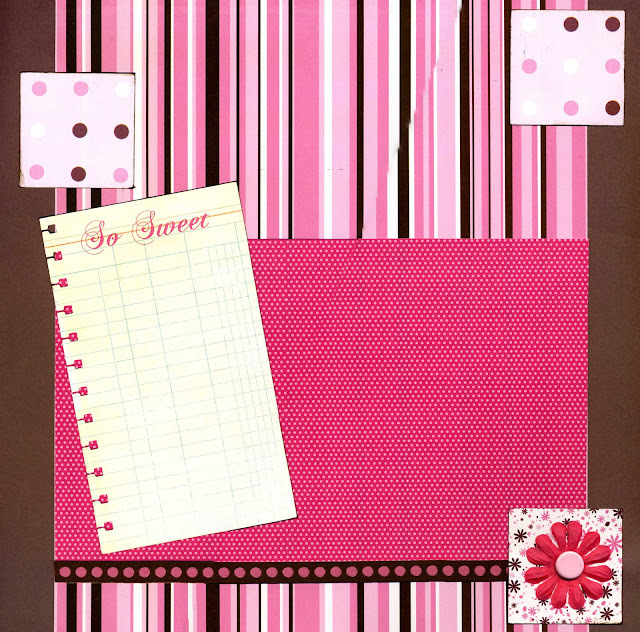 Girl - 12x12" layout in pink and brown with multiple patterned papers, a 3x5" embellished "So Sweet" journaling block, pink dotted brown ribbon and a hot pink floral embellishment with large pink brad. Small block papers and journaling block have inked edges. 3. 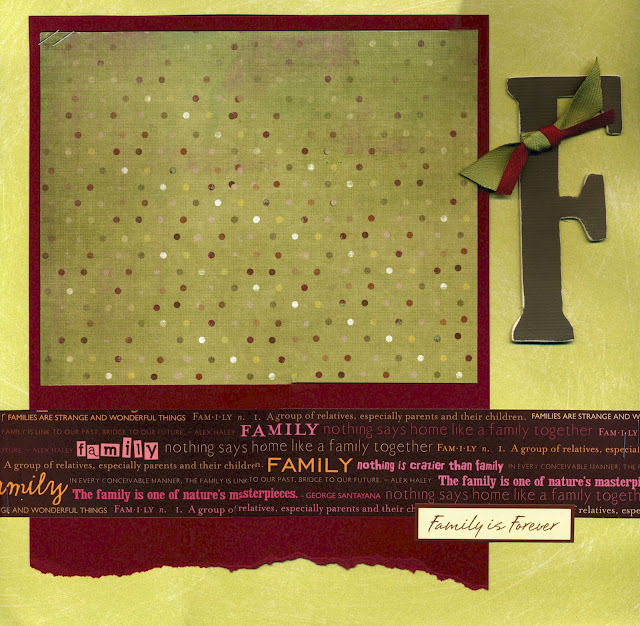 Family - 12x12" layout in lime and burgundy featuring torn edge cardstock and "family" embellished paper, photo mat large enough for up to an 5x7" photo, chipboard "F" with sanded edges and ribbon embellishment and "Family is Forever" sticker. Staples added for enhancement. 4. 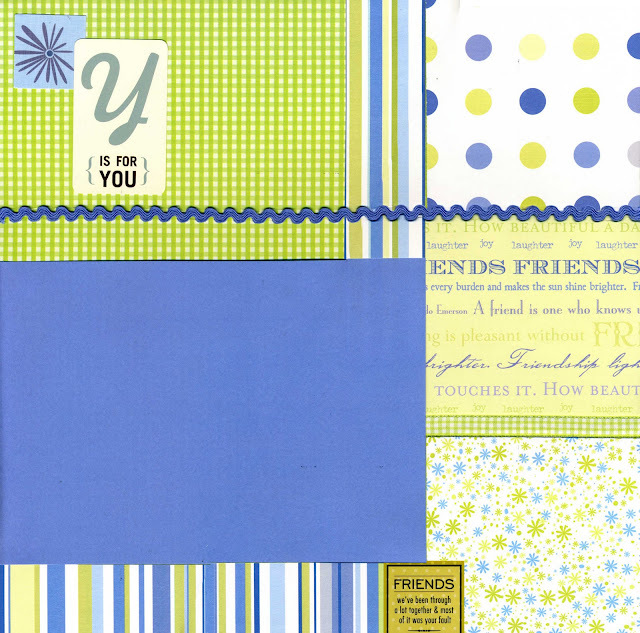 Friends - 12x12" layout in lime and blue with multiple patterned papers, two different types of ribbon (grosgrain and rickrack), two sticker embellishments ("Y is for You" and "Friends - we've been through a lot together & most of it was your fault") and a 5x7" mat area. 5. 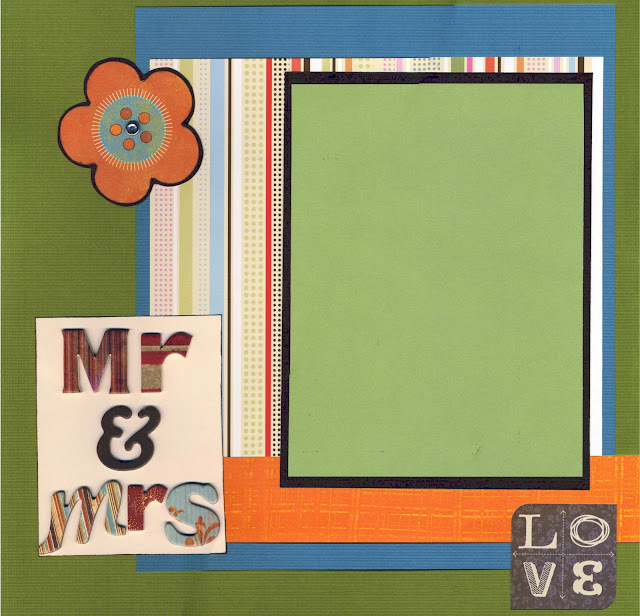 Mr & Mrs. - 12x12" layout with multiple layers of heavy cardstock and patterned paper. Die cut flower embellishment with jewel brad attachment, "love" sticker and "Mr & Mrs" chipboard lettering on inked cardstock background. The winner of this package will receive all five scrapbook layouts via postal delivery courtesy of the donor. THIS PACKAGE IS VALUED AT $40.00. BIDDING WILL START AT $10.00 AND WILL INCREASE BY A MINIMUM BID OF $5.00 PER BID.